One Tsinghua University study estimated that 34 percent of so-called “sludge,” which contains a mix of human excreta and industrial waste, ends up in landfills, 14 percent is discharged untreated into the environment, and a whopping 48 percent is used as fertilizer by farmers. A group of private citizens in Beijing have started their own “war on pollution,” as the government has branded its anti-smog efforts, by creating a “sludge siege map” that pinpoints the locations of more than 30 dumping sites around the city. Caixin Media produced a video report (in Chinese) in March 2014 touring sites along the outer edges of the capital; at least four are on farmlands or forested areas. China’s environmental problems are myriad, but without proper treatment and disposal, pollutants from this untreated sewage byproduct are like a hidden time bomb, endangering the long-term safety of food, water, and public health. Cleaning up heavy metals that have accumulated in the soil is difficult and contamination can affect generations to come. According to a report by the Asian Development Bank, China’s wastewater plants produced approximately 30 million tons of sludge in 2012, or five of Egypt’s Great Pyramid of Giza. 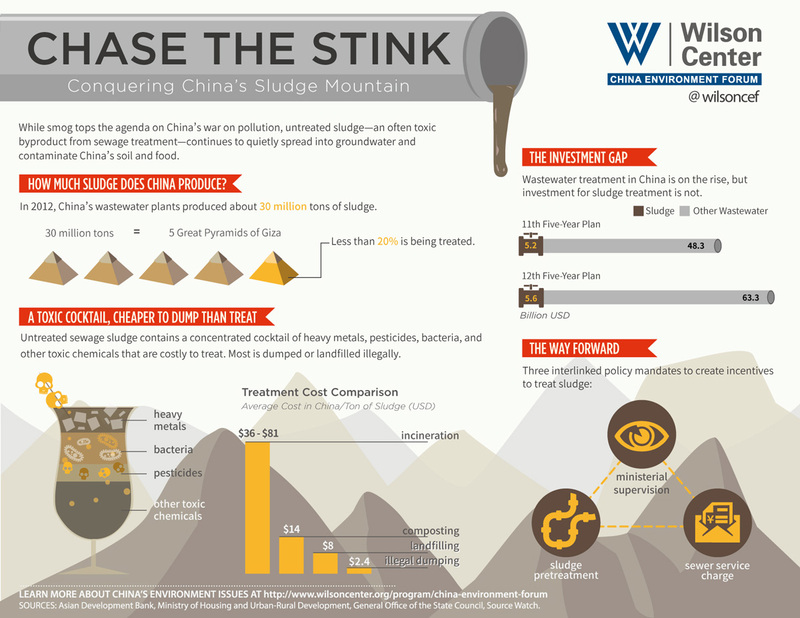 Less than 20 percent of this ever-expanding mountain of sludge is being treated. Wastewater facilities in the United States and Europe are designed to separate solids from wastewater. The residuals go through a tertiary treatment to reduce disease-causing bacteria, viruses, parasites, and heavy metals so the remaining solids (dry sludge) can be safely disposed. Chinese wastewater treatment plants typically stop at secondary treatment and the remaining watery slurry is only lightly treated, if at all. Many existing wastewater treatment plants either lack the sludge treatment facilities or are unwilling to pay the extra costs of using them. During the 12th Five-Year Plan (2011-2015), the Chinese government planned to invest RMB 427 billion ($69.4 billion) into wastewater treatment, a 22 percent increase over investments during the previous Five-Year Plan. According to Suez Environment, 350 to 450 grams of sludge is produced per cubic meter of wastewater. Since the amount of sludge swells proportionately with the growth of wastewater treatment capacity, the budget should too. Strikingly, the sludge treatment sector received only RMB 35 billion ($5.6 billion), a growth of 7 percent over the previous period. Poor sludge management is driven by three main factors: lack of data, a fragmented regulatory system, and low water prices. Perhaps the most troubling is the paucity of detailed, reliable data on treatment and disposal. According to the Asian Development Bank, only about 20 percent of sludge undergoes a secondary stabilization process in China, and 13 percent of the stabilized sludge is properly prepared for agricultural application or other productive uses. The “dominant practice,” they write, for more than 80 percent of sludge is simply dumping it into landfills, raw and untreated. Besides the Bank report and Tsinghua study cited above, however, there is little data available. Another barrier is a highly fragmented administrative system. It is unclear which ministry is in charge of overseeing treatment facilities, falling somewhere between no less than five ministries: Environment, Agriculture, Finance, Health, and Housing and Urban-Rural Development. Thus far, most government-issued documents on sludge treatment only focus on technical guidance or minor policy details rather than industrial standardization and regulations. Low water prices also introduce perverse incentives for treatment facilities. The cost of sludge treatment is often not included in wastewater fees or charged at an insignificant rate. For instance, a miniscule RMB 0.04/ton of wastewater is charged for sludge treatment in Guangzhou. As a result, many plants would run at a loss if they processed sludge and with lax oversight, many simply choose not to. Perhaps not surprisingly, the ambitious targets set in the 12th Five-Year Plan for sludge treatment, including a requirement that all municipal wastewater treatment plants install sludge treatment equipment by the end of 2012, have not been met. Restructure ministerial supervision. At present, the institutional responsibility for overall coordination, planning, and management of sewage sludge is not defined. Experts say that the Ministry of Housing and Urban-Rural Development should take the lead to reorganize and restructure ministerial supervision. Though local governments are responsible for overseeing the construction and operation of treatment and disposal facilities, these duties are not effectively performed. There needs to be legislation assigning responsibility for sewage management within the framework of overall urban planning. Incorporate sludge treatment into water fees. The RMB 60 billion ($9.8 billion) investment in sludge planned in the 12th Five-Year Plan accounts for only 30 to 40 percent of needed funds, according to Sing Cho, an urban specialist at the World Bank. The private sector is expected to contribute the remaining 60 to 70 percent. Given the high capital costs in sludge treatment, however, current wastewater fees make it almost impossible for the private sector to recoup their investments. In the United States, water rates are set to cover the entire cost, since sludge treatment is seen as an integral part of the wastewater planning process. Industry experts in China suggest that average fees to cover sludge treatment should be RMB 0.4-0.6/ton of wastewater (¢7-10/ton), depending on the technologies used. Prioritize pretreatment. Even with proper facilities and fees, the amount of heavy metals and other pollutants entering the water system from non-residential sources essentially prohibits the safe reuse of sludge byproducts. Al Appleton, the former New York City commissioner of the Department of Environmental Protection and director of the New York City Water and Sewer System, believes a potential solution is the U.S. practice of pretreatment at the source, before pollutants are dumped into sewage. “Dealing with the sludge issue via pretreatment strategies gives you a double bang for the buck,” he said, making it easier to treat both sewage and the resulting sludge. China’s massive investments in wastewater collection and treatment systems in recent years have not been matched by complementary investment in sludge management. Consequently, while significant improvements have been made in reducing surface and groundwater pollution, there is now a growing challenge to prevent secondary pollution from accumulating waste. Appleton holds that sludge management in China should be tied to dealing with water pollution in general. Perhaps the most promising opportunity then is the upcoming Water Pollution Prevention and Control Action Plan, China’s equivalent to the U.S. Clean Water Act, which is expected to elevate water pollution prevention and pretreatment across the country. Hongli Liu is a Master’s candidate in public policy at the School of Public Policy, University of Maryland. Siqi Han produced the infographic and is a Master’s candidate in environmental economics and policy at the Duke University Nicholas School of the Environment. The authors would like to thank Jennifer Turner, Ilaria Mazzocco, Susan Chan Shifflett, Qinnan Zhou, Darius Izad, and Xiupei Liang for their help. Sources: Asian Development Bank, Caixin News, China Greentech Initiative, ChinaDialogue, Jiangsu Institute of Environmental Industry, Reuters, Sohu, Suez Environment. Waste vs Technology=Sustainability. There is a most advance sludge plant that can be introduce into a Primary or Secondary or trial at the end of the biosolids turning from the current waster treatment plant into biosolids (Energy pallets)of which pyrolysis technology can be used again producing fuel and electricity.With the water flowing into the stream,a filtration plant will be used to finalise quality of the water to 99.7% clean. China need to make contact with the small innovative international groups that have the technology. I would recommend someone in the region who is very serious to make contact…dliufalani@gmail.com. The most natural way out is to address the issue by incorporating the management and treatment of sewage sludge in a combined facility with the management and treatment of municipal solid waste to manufacture renewable sources of energy and fuel. Sludge when presented raw is barely 6% dry solids content. Unless you remove the water before-hand further treatment is impractical. Using wet air oxidation at a solids ratio of 6% is practical and very easy. However the draw-back is the energy output which although it is positive is less than enough to sustain. Combining this with municipal solid waste though has its benefits as the former with its water can be used to balance the needs with the latter and from the combined total manufacturing renewable fuels and energy is simple technology.